Who doesn’t love waterfront dining?!? It is one of the many reasons we love Florida! 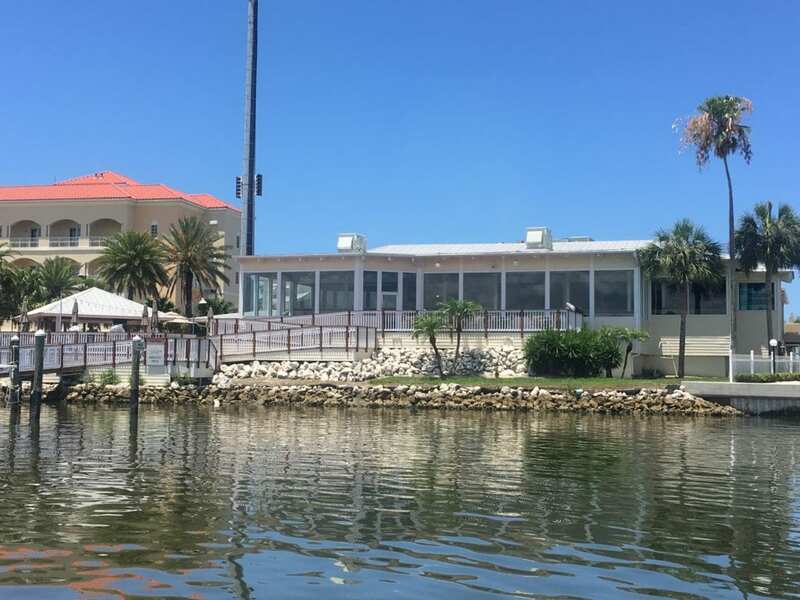 Hoping on the boat and exploring some of Pinellas County’s finest waterfront restaurant options is a MUST DO if you are visiting Florida for vacation, or are a local resident without a boat! Salt Rock Grill: Located in Indian Shores, Salt Rock Grill offers both inside and outside seating and a large outdoor Tiki Bar! We enjoy stopping here for Happy Hour and an appetizer or two. Reservations are recommended for dinner inside or outside. The Pub Waterfront: This casual, family-friendly restaurant is one of our “go-to’s” for a great lunch on the water! The friendly staff, the Rum Runners, and the Burgers keep us coming back. Indoor and outdoor seating available and they also host a Sunday Brunch. Miss Vicki’s on the River: Think biker bar on the water! Located on the Anclote River in Tarpon Springs, this great little local spot offers live music, beer & wine, and a great lunch menu including boiled peanuts, fish spread, sandwiches, and our favorite – a Greek Salad! We recommend you ask for fish atop your salad, and make sure you ask for the small (unless you are sharing!). Gators on the Pass: When cruising all day, we like to head south to John’s Pass and stop at Gators. This is a great lunch spot to watch a game or to watch the boats coming in and out of the pass. Frenchy’s: The Clearwater location is accessible by boat and has great docks, so an easy win for us! Great drinks and fresh seafood are the standards at this local watering hole! If you are feeling a bit adventurous, try the grilled octopus! Having lunch or dinner at any of these great Pinellas County restaurants make a great day out on the boat. Most of these stops can be achieved with one of our 1/2 day charters (except Gators). We like to allow time for you to eat and relax before heading back to the dock. This trip as we call it, Destination Dining, would make a great family day out or lunch date with friends! If you are vacationing to Florida, this is a great way to see the Intracoastal Waterways of Pinellas County! If you are a local, or a repeat vacationer and have a favorite waterfront restaurant – we would love to hear about it! Leave us a comment below and let us know your fav! If you liked this post, please share it using our share buttons below!